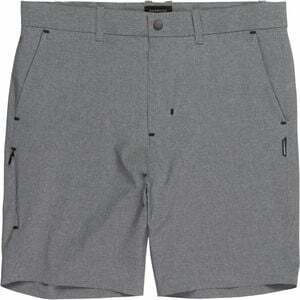 Loaded with features and perfect for minimal travel, hiking, or pretty much anything else warm-weather related, the Quiksilver Men's Amahai Short is dialed in for your next amphibious adventure. Equipped with tons of stretch, a durable ripstop fabric, and tons of pocketry, the Amahai is begging to be the standout of your upcoming Indo surf odyssey and is made to perform just as well in the water as it is at the tiki bar. Plus, the low-key invisible side-seam pocket is great for stashing your car key while ripping the set, or for stowing travel docs away from hustlers, thieves, and entrepreneurial mischief-makers.